The Basque Press Office (Oficina de Prensa para Euzkadi – Euzko Izpar Banatzea – Service Basque de Presse (OPE-EPI)) was founded by the Basque Government in exile in 1946, the year that institution was reorganized after the end of the Second World War. The OPE had two main activities: attending to foreign journalists and correspondents, and publishing a Bulleting that would run uninterrupted until 1977. To find out more about this body of the Basque Government, we recommend you read the Auñamendi Encyclopedia article on it. We’re blogging about the OPE-EPI because while rummaging around the one of the most interesting websites about Basques in the world, Euskaletxeak, we discovered that it’s possible to consult all the bulletins this body of the Basque Government published between its first issue on May 2, 1947, to its final one on July 22, 1977. That was 31 years of work and more than 30,000 pages of news that talks about what was happening in the Land of the Basques and everything that affected it. the 1955 betrayal of Western democracies when they allowed the Spanish dictatorship to enter the UN. All that was accompanied by the natural wear and tear caused by forty years of living in exile, for those abroad, and of living in the heart of the fascist repression for those who worked “from inside”. This was a miracle born of the commitment of those special men. Those at home kept the fight alive. Those in their posts in exile managed to ensure that the voice of democratic Basques was still heard. And those around the world worked long and hard to keep that voice alive with their support and commitment. And in those 30,000 pages is condensed, in some way, all that effort. That intent, that goal to be heard, to have a voice of their own that wasn’t drowned out by Francoist howling, to awaken the sleeping consciousnesses and morals of the democracies of the world — it’s a summary of the commitment of two, almost three generations, who fought for Freedom, Justice, and Democracy. Going deeper into the OPE-EPI bulletin pages is an incredible experience. Don’t miss browsing through its pages, even if it’s a bit like playing the lottery right now, since you don’t know what you’re going to find. It’d be great if the indexes and summaries that headed every page were scanned and linked with the pages they refer to. That would really help searches, making it even easier to dig deeper into this part of our history without doing so blindly. We’re also blogging about this today in memory of all those who made this incredible work in such hard conditions possible, convinced that many people are going to really enjoy going so deep into the stories that make up our History. Also, we have to admit that we’re excited and proud to see that, at least in some small way, this blog we’re running is following the path that, at least in a part of its content, was laid out by the Basque Government Bulletin. By that we’re referring to how we, as far as we can, collect stories from foreign media about Basques. We also recommend you check out this entry about Radio Euzkadi, which was the voice of the Basque Resistance during the whole of the Franco dictatorship. 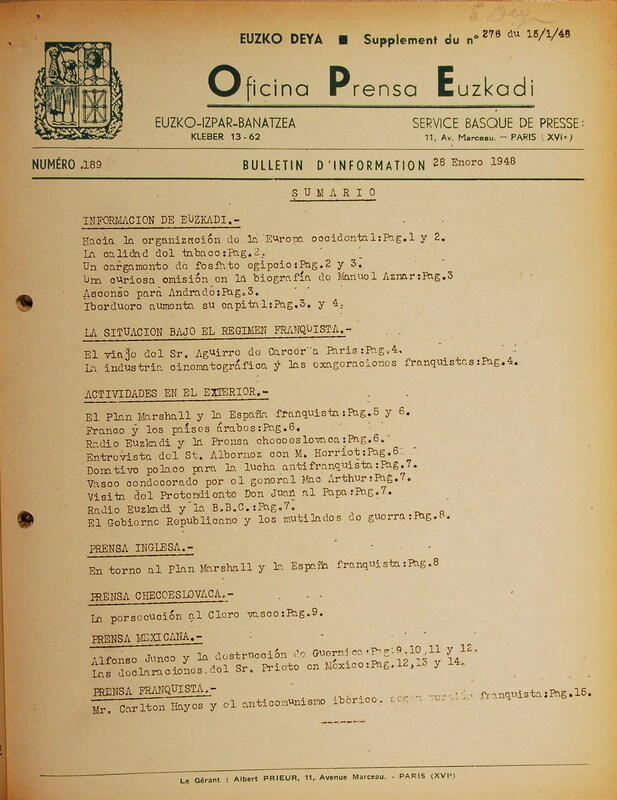 The scans of the Oficina de Prensa de Euzkadi, the official publication of the Basque Government in exile (1947-1977) has also been included in the initiative to recover the historic memory of the Basques abroad. The volume of this work is over 32,000 pages long.